Opti makes it easy to have the right information, in the right place at the right time. 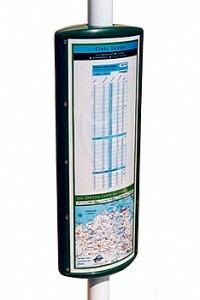 Suitable for passenger transport timetables, information notices restaurant menus, promotions and advertising. Opti makes it easy to keep your information right up to date. Just print the information insert in-house on your office printer, laminate and its ready to use. With Opti, you can get all your information where it counts, right at eye level, at the point of sale. Opti comes in many models to suit any situation. 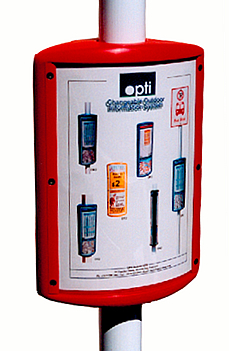 By using Opti your well informed customers will respond with increased patronage and customer satisfaction. All of our products have been designed and are manufactured to the highest standard by QED Systems. 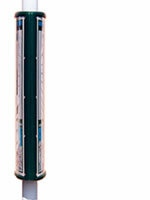 OR1: Double sided rotatable model for round poles. Takes one A4 insert per side. Manufactured from high density polyethylene. The same durable vandal, weather and graffiti resistant material used in modern playground equipment. 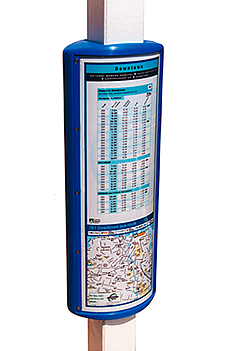 OR2: Double sided rotatable model for round poles. Takes 2 A4 inserts per side. 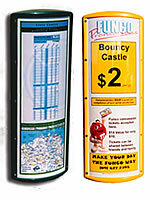 The same durable vandal, weather and graffiti resistant material used in modern playground equipment. OS2: Double sided rotatable model for square poles. Takes 2 A4 inserts per side. 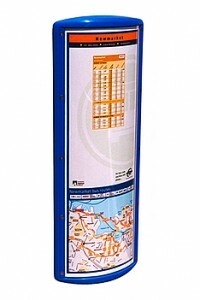 OF2: Single side model for flat walls, lampposts and bus shelters. Takes 2 A4 inserts. Overall size 645mm high x 235mm wide.